Want to take a class? No problem. Guests in town? Explore more. Business meeting? Don't be late. Big occasion? Don't miss it. 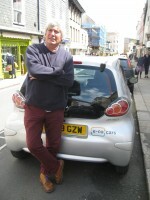 E-cocars is a car share club based in Totnes, Devon. Book a car online or with a smartphone and you’ll have a car just when you need one – for an hour, a day, for as long as you like! We take care of insurance, MOTs, maintenance, cleaning and parking spaces. Drive a car without the costs and hassles of individual car ownership. Why not join the growing community of drivers who find pay-as-you-go motoring cheaper, more convenient and less hassle than owning their own car?